Address: S. 21 1/2 Rd. And Little Park Rd. Grand Junction, Co.
Glade Park Fire, Grand Junction Fire and Mesa County SARC were all part of a high angle rescue today in the area of S. 21 1/2 Rd and Little Park Rd. Dispatch reports that a vehicle with 2 people in it, drove off the dirt road and fell approx. 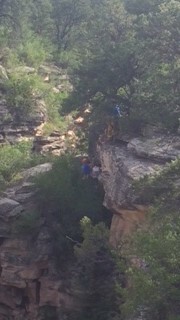 75 feet down a rock cliff into a ravine. The manner in which this accident occurred in being investigated by law enforcement. After approximately 3 hours, the Mesa County SARC and Grand Junction Fire Department where able to safely extricate and rescue both patients. Both patient’s injuries are considered relatively minor (at the current time), however, they are being transported by ambulance to a local hospital for further evaluation due to level of severity and damage that was sustained to the vehicle in this incident. No responders or rescue personnel were injured in this incident, and all questions regarding this incident with be direct to law enforcement.